Deep in an area renowned for its independent and strong ancestral culture, the Basque Country is in the southwestern-most part of France, just half an hour from Spain. Here, Irouléguy received its appellation contrôlée in 1970, with about 250 acres of vineyards cultivated by 60 growers.Jean-Claude Berrouet is an Irouléguy native who left home to serve for more than three decades as the winemaker at Château Pétrus. But the Basque region has a powerful pull, and Jean-Claude eventually returned home to his native soil. 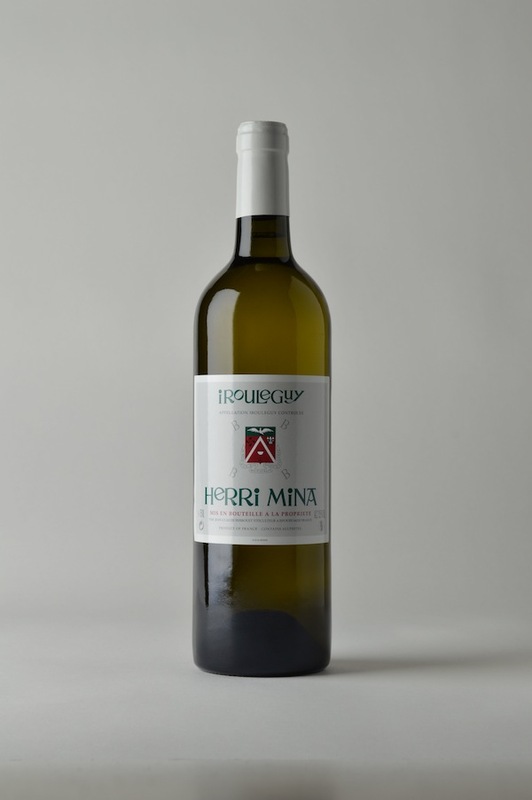 Appropriately, he named his estate “Herri Mina”; in Basque, herri means “country,” and mina means “homesick.”Jean-Claude makes a splendid white blend of Gros Manseng, Petit Corbu and Petit Manseng. The vines are planted on the somewhat-steep south-facing slopes of the Pyrénées, no higher than 400 feet above sea level, to enjoy the climatic influence of the Atlantic. They are protected from cold north wind and receive more sunshine than most other French vineyard regions. In small quantities, Jean-Claude also produces a character-driven red wine from 100% Cabernet Franc. The Basque are no-nonsense, straightforward people. So, too, are their wines. Jean-Claude’s are perfectly made, very clean and bright, with more complexity than is often found in the region. The delicious, seductive wine is a favorite in Basque restaurants and pairs well with California cuisine. Martine’s Wines is the exclusive importer for Herri Mina in all of the United States.